Founded in 1906, ONEOK (OKE) is a large energy midstream service provider with an especially dominant presence in the shale formations of Oklahoma. The firm's pipelines and storage facilities are connected to over 140 gas processing facilities across the country, making it incredibly valuable to its core natural gas liquid (NGL) customers. Thanks to over $9 billion in investments made between 2006 and 2016, the company has diversified its operations to include some of America's largest and most important oil & gas shale formations including the Permian basin and the Bakken shale of North Dakota. ONEOK is now well-positioned to serve some of the fastest-growing shale formations in the country. ONEOK is primarily focused on natural gas liquids such as butane, ethane, propane, and pentane. These liquids are generated when natural gas (methane) is produced. NGLs are used as feedstocks in high margin petrochemicals, many which are slated for export to Europe, China, and India. However, it should be noted that ONEOK is a major player in natural gas exports to Mexico, via its 50% ownership of the Roadrunner pipeline. The company just signed a 25-year contract to supply Mexico's largest utility with gas as it transitions from coal to gas power generation. In 2017, ONEOK merged with its master limited partnership ONEOK Partners in a $9.3 billion all stock deal. This helped simplify the corporate structure and reduced its cost of capital via the elimination of its incentive distribution rights (IDRs). ONEOK is a C corporation that pays dividends (not distributions) and uses a 1099 instead of a K-1. The midstream industry has several attractive qualities. Pipelines are very expensive and time consuming to construct, creating high barriers to entry. and there are numerous regulations that must be complied with. Few companies have the capital and industry connections (e.g. oil & gas producers, regulators) to build and operate pipeline systems, which are also highly regulated. Only so many pipelines are needed within a particular geographic area as well, often resulting in a consolidated market. Pipelines also have few substitutes given their safety and cost-efficiency, along with geographical constraints (many shale formations are in hard-to-access areas). Furthermore, pipelines enjoy relatively stable demand patterns since many of the products that require refined oil and gas are non-discretionary in nature. And their tollbooth-like business model minimizes their exposure to volatile commodity prices. In a way, the midstream industry is similar to utilities in that it provides an essential service for U.S. oil, gas, and NGL producers, resulting in a stable and recurring cash flow stream that can support generous and steadily rising distributions and dividends over time. As a result, ONEOK has managed to successfully grow its distributable cash flow (DCF) despite some challenging industry conditions in recent years. DCF is similar to free cash flow for the midstream industry and funds dividends and distributions. More importantly than just growing its cash flow is the fact that over time management has focused on increasing ONEOK's business stability. Specifically, the firm has focused more on long-term contracts such as for its NGL fractionators (what separates NGLs from natural gas). These contracts are usually for seven to 10 years and are fixed-rate, inflation-adjusted deals that ensure stable cash flow over time. Less than 10% of the company's cash flow is subject to commodity prices or volumes on its systems today, down from more than 30% in 2013. This increasingly stable cash flow has allowed ONEOK to maintain a stable or growing dividend for more than 15 consecutive years, including during the oil crash in recent years. 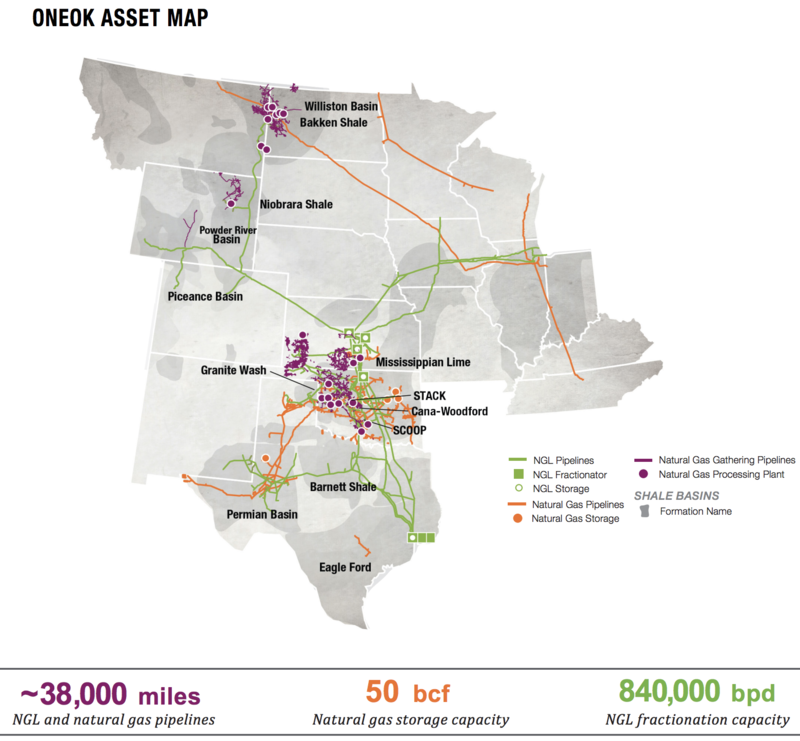 ONEOK's core growth thesis is America's ongoing energy boom, especially in NGLs. For example, between 2017 and 2022 U.S. NGL production is expected to increase 51%, with the Permian basin (where ONEOK is well positioned) making up the majority of that growth. ONEOK's main growth catalyst is its large backlog of $4.2 billion in growth projects it plans to put into service by the first quarter of 2020. 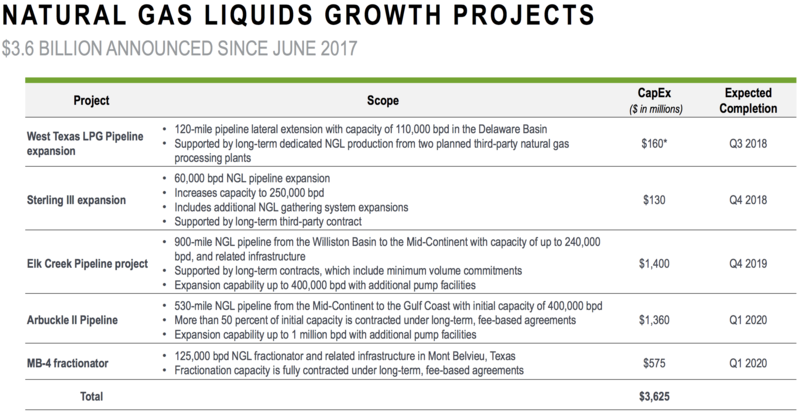 All of its future growth is focused on NGLs and gas gathering projects which usually have higher margins than natural gas transportation pipelines and are supported by 10- to 20-year contracts. Beyond 2020, ONEOK is likely to continue benefiting from the massive growth in America's oil and gas production. 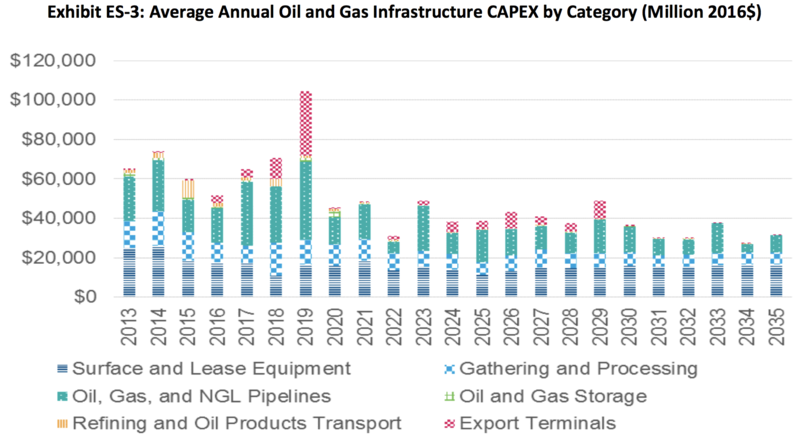 For example, the U.S. Energy Information Agency expect U.S. oil production to grow through 2030, and U.S. gas (and NGL) production to keep rising through 2050. That in turn means much more demand for midstream infrastructure to store, process, and transport U.S. gas, NGL, oil, and oil condensates. Much of that production will be exported globally, especially to Europe (where energy prices are much higher) and rapidly growing emerging markets such as China and India. In fact, it is estimated that by 2035 nearly $800 billion in new midstream projects will need to be brought online to support this energy boom. As a result, ONEOK should have little trouble maintaining a strong growth backlog over time to help drive healthy growth in DCF per share and dividends. To help fund this growth, the company plans to use retained DCF as well as an increasingly conservative amount of low cost debt. During the oil crash, many midstream operators got into trouble by having too much debt. That was a result of growing their dividends too quickly during the boom years when oil prices were about $100 per barrel. As a result, many of these firms paid out almost all their DCF as dividends and retained very little DCF to fund internal growth. Instead, they relied on debt and equity funding. However, when the oil industry was crushed, fears over rising bankruptcies (and customer contract defaults) caused credit markets to slam shut. In addition, low share prices resulted in many midstream stocks being unable to raise equity growth capital at profitable rates (their cost of equity rose too high). ONEOK used to be one of those overleveraged midstream companies with a peak leverage (debt/EBITDA) ratio of 6.7 back in 2013. However, over the years management has made it a priority to deleverage aggressively and today the company has a strong balance sheet that grants it a stable BBB investment grade credit rating from Standard & Poor's. In addition, in 2017 the company had a distribution coverage ratio (DCF / distributions) of 1.34, meaning it retained a significant portion of its cash flow to reinvest in future growth. The distribution coverage ratio is arguably the most important payout safety metric investors need to focus on (balance sheet is second). In the midstream industry, a coverage ratio about 1.1 is considered low risk and capable of supporting long-term payout growth over time. In 2018, management is guiding for a coverage ratio of 1.27. ONEOK plans to always maintain at least a 1.2 coverage ratio despite impressive 9% to 11% annual dividend growth targeted through the end of 2021. That coverage should be high enough to ensure a safe payout, as well as retain enough cash flow to allow ONEOK to maintain a safe balance sheet. As a result, the company seems likely to preserve its strong credit rating and have ongoing access to low cost borrowing even in a rising rate environment. ONEOK's high yield, fast dividend growth potential, and financial conservatism make it a potentially attractive option for income investors to profit from America's ongoing energy boom. That being said, there are several risk factors to consider before investing in ONEOK. One risk investors need to keep in mind with ONEOK is that while the firm is currently generating 90% of its cash flow from long-term, fixed-fee contracts, that mix may change for the worse in the future. This is because the NGL and natural gas gathering segments only derive about 80% of their cash flow from fixed-fee contracts. Natural gas pipelines have 95% fee-based contracts which are inflating the overall figure. However, in the future as ONEOK focuses exclusively on the faster growth and higher margin NGL side of the business (and gas gathering to support it), its cash flow variability might double to as much as 20% of company-wide results. As a result, ONEOK's DCF would be more at risk than most of its peers to disruption in the case of another energy price crash. In fact, if the firm's cash flow variability rises to 20%, then the company could hypothetically see its distribution coverage fall from 1.2 to 1.0 during another energy price crash. While that would likely still allow ONEOK to maintain its payout, the dividend might end up frozen, disappointing investors who have grown accustomed to the company's fast payout growth rate. Execution risk is another factor to consider. Specifically, management's ability to achieve its ambitious growth targets relies on completing its projects on time and on budget. That's not always easy to do as large pipeline projects can face long and costly delays. For example, Kinder Morgan (KMI), America's largest midstream company, recently cancelled its largest growth project, the Trans Mountain Pipeline expansion. In fact, it sold the entire thing to the Canadian government after five years of legal battles that blocked construction. That project represented 50% of Kinder's growth backlog which means the company's long-term growth potential took a major hit. Enbridge (ENB), the largest midstream company in North America, has also faced over 18 months of delays on its Line 3 replacement project (about 40% of its growth backlog), and now Minnesota regulators are challenging the company about whether or not that project even needs to be built at all. The point being that while large growth backlogs that support fast dividend growth guidance are nice, investors always need to remember that guidance is never a promise, but merely the current plan. Plans can change quickly if projects face cancellations or long enough delays. Another potential risk is the rising cost of construction. Specifically, U.S. steel tariffs are expected to boost pipeline construction costs by 3% to 5% in the coming years, for as long as they remain in effect. ONEOK is not a self-funding midstream company, meaning that it still funds much of its growth through equity issuances ($1.2 billion in January 2018). That financing strategy will work fine as long as ONEOK's share price remains high enough to keep its cost of equity low. However, in the event of another energy crash and/or bear market, the stock's share price might fall too low to allow the company to grow profitably. In the event that ONEOK transitions to a self-funding model (no more equity issuances), its dividend growth rate would likely slow drastically, at least for several years. ONEOK is one of the largest NGL-focused midstream companies in the country. Despite some earlier struggles with a relatively high mix of commodity-sensitive cash flow and stretched debt levels, management has managed an impressive turnaround, and all while maintaining a stable and rising dividend. 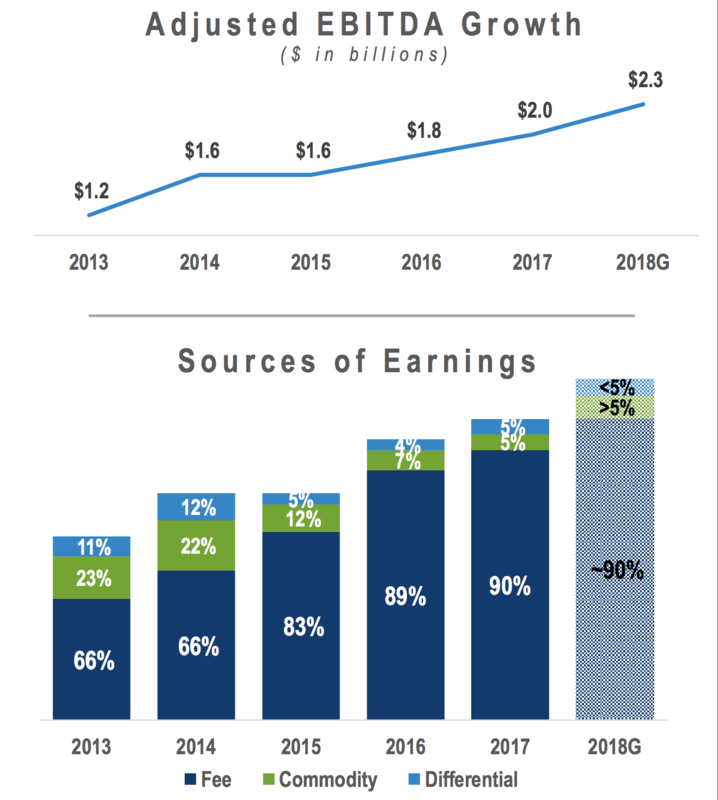 With its much stronger balance sheet, large long-term growth runway, and plans to maintain an above-average distribution coverage ratio, ONEOK appears to be poised for many years of generous and steadily rising dividends. The company could potentially be a decent choice for high-yield income growth investors who are comfortable with its risk profile, and who want exposure to America's ongoing energy boom.